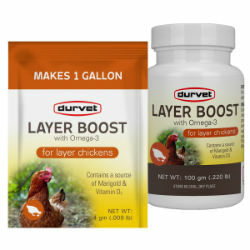 Contains a blend of vitamins, electrolytes, enzyme, omega 3, and Marigold for daily use with layer chickens. Contains a source of live (viable) direct fed microorganisms. Contains a source of Marigold & Vitamin D3. Improves the quality & quantity of eggs. Ideal for laying hens. It's easy! One scoop per gallon of drinking water. May be used together with other Durvet poultry soluble products. Enclosed scoop equals 4 grams. For dietary supplementation mix 1 scoop per gallon of drinking water. Refresh water daily. Makes 25 gallons. Maltodextrin, Sodium bicarbonate, Salt, Dried Aspergillus oryzae fermentation extract, Potassium chloride, Dried Enterococcus faecium fermentation product, Dried Lactobacillus acidophilus fermentation product, Ascorbic acid, Vitamin A supplement, Niacin supplement, Vitamin D3 supplement, Riboflavin supplement, Vitamin E supplement, Flax seed meal, Thiamine hydrochloride, Vitamin B12 supplement, Tagetes (Marigold).